Wireless Maritime Services (WMS) provide cellular voice and data services on ships at sea. They are the world leader to provide this service due to their experience,technology and having the right people. Founded in 2004 and is a joint venture of AT&T Mobility and SeaMobile Enterprises. WMS supports GSM, GPRS & CDMA technologies. AT&T is the leading GSM carrier in United States with international roaming in over 200 countries worldwide. SeaMobile Enterprises through their MTN Satellite Services division provide global connectivity virtually anywhere in the world. When the ship sails out of port, WMS will turn itself on. When the ship is approaching port, the in-ship system will turn itself off. Once in port, the ships can connect to local roaming networks as permitted by their home carrier. Customers of over 340 networks around the world whose carrier permits international roaming can use WMS. Compatible devices and carriers connect automatically to WMS at sea. Billing is by the home network at the rates they determine. You may check with your network carrier to know what they charge for this service. Here are the shipping companies and ships using WMS. Here is the block diagram explaining WMS at Ship side and Shore side. 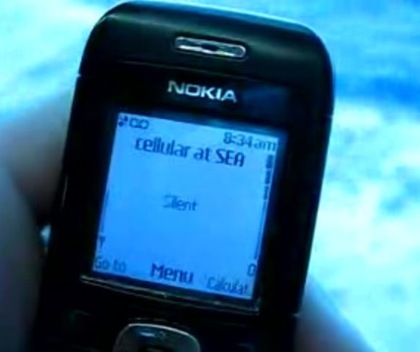 Here is a photo, to show how ‘cellular at sea’ gets displayed on your mobile phone when using WMS. For more information on Wireless Maritime Services, log on to Cellular at Sea.